Extreme conflict and difficult geographical terrain can at times act as a strong barrier towards the development of a village and the betterment of its people. This in turn has adverse effects on numerous essential services including education and general standards of living. Home to 22 tribal families, the lonely village of Bhokakhera in the Latehar district of Jharkhand is unfortunately one such village. The village currently has only 1 primary school with 1 para teacher from a nearby village. Initially, this already sanctioned school, could not get constructed because of the lack of roads and transport facilities. This instead saw the village people rising so efficiently to overcome the issue – they themselves, with support from NEG-FIRE and our partner working in the area – Vedic Society, started carrying the raw materials to the site of the to-be-constructed school. As a result, now there is a fully functional primary school in the village. Unfortunately there is no provision of facilities for children who want to study further. Fear of extremist groups prevents the families from sending their children to schools located outside the village. 3 children from Bhokhakhera one fine day decided to change the course of their life. After continuous requests to their respective families and numerous intervention by Vedic Society and NEG-FIRE, Prakash, Sawan and Christina, were finally allowed to go to a school 2 hours away from the village to continue their secondary education. This however, meant crossing hills and climbing trees and bushes for 2 hours every morning and 2 hours in the afternoon to cover the distance between the school and the village. They continue to do so till today and have motivated other children and their families as well to do the same. 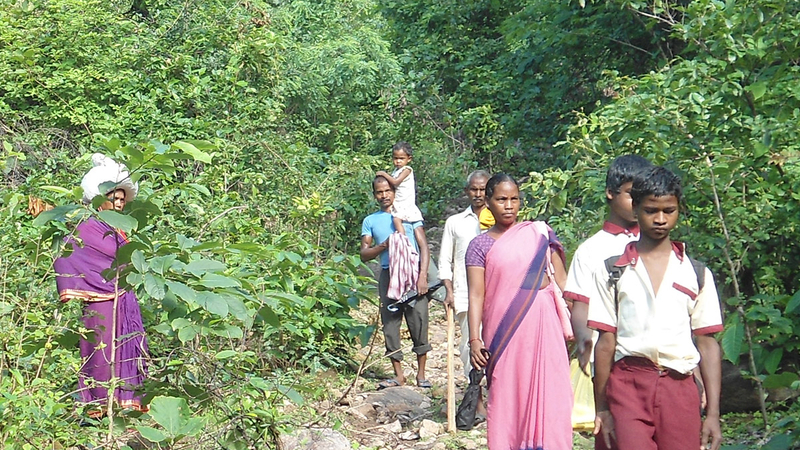 Prakash, Sawan and Christina, along with the entire Bhokhakhera are now on their way to have a brighter future. They are a great example of immense strength and will power and have undoubtedly changed their lives and the lives of many others.